As you’ve probably noticed, my website has now finished its major overhaul, and it’s great to finally have it up and running. Although the content is much the same as my old-look website, and the old blog has been imported over to here, there are a number of benefits to this new design which I am really happy about. Firstly, it’s all in the one place – the website and blog are both hosted on simonvarwell.co.uk, which means you can surf seamlessly between the blog and the other pages, and the blog is now at the succinct address simonvarwell.co.uk/blog. So don’t forget to update your links, bookmarks and RSS feeds – though I am keeping the old blog up for the time being in case there are historic links to entries there from around the interweb. Secondly, the design is a lot more flexible. For instance, the old site was designed with iWeb on the Mac, and the old blog hosted on wordpress.com. Both those formats, while pretty enough, were not just different to each other but quite rigid and the website was cumbersome to publish. The new look, where WordPress is hosted on my own filespace, is something I can play around with a lot more, with an easy-to-use interface underneath the bonnet, and publishing is easy because it’s directly on my server space. This flexible design means I’ve been able to make the site a lot wider than its two predecessors, meaning there is less wasted space on the left and right. I’ve also been able to replace the single banner photo with a randomly rotating pool of over a dozen pictures, which will change over time. These represent some of my best efforts at photography (or at least, those photos that lend themselves to a 900×200 pixels crop). The random pool of images, I think, makes the site look continually fresh and interesting, despite my words’ probable effect to the contrary. Of course, this isn’t really my handiwork at all. The complicated and technical stuff is all down to my friend, web designer and WordPress expert Matt Bee, who I think has done a sterling job over the past few weeks in designing the site and working with me to ensure I know how to maintain it myself. Tuesday 5 January 2010 in Technology. Yay for updated websites, I’ve just refreshed mine a bit too — and I’ll try and update any links pointing to your old site. Like the new layout, and it makes sense to put everything all in one place; plus you can install your own plugins etc. 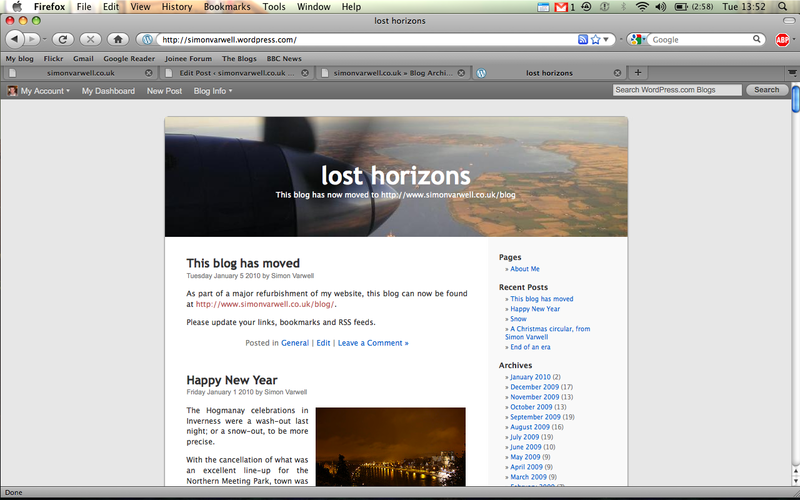 However, the ‘Why “Lost Horizons”?’ link in the sidebar still points to the old wordpress.com blog. I like it! Here’s to another busy year for you, sir! Thanks guys, and thanks for updating your RSS feedy stuff Phil. Donald, yes I saw your refresh the other day. Looks good. Thanks for pointing out the wrong link, however – duly solved. All in the name of making life interesting, Morag.